Most guitar students who take lessons only get to see their teacher for about 30 minutes per week. This is not enough time. To advance, you need to practice and spend time with a teacher every day. That’s why it should be one of your teacher’s top goals to help you become your own teacher. The beginning, or the end? Mastery is sometimes thought of as having “finished” the study of something. As if by learning everything there is to know about guitar, we can close the book, go outside, and enjoy the sun. But the longer you’ve been playing the guitar, the more you have to learn. That’s because our awareness expands faster than our abilities. As we are mastering one trick, we become aware of five or ten more. This continues on and on forever. Which means one can never master the guitar, and that’s what makes it so interesting. 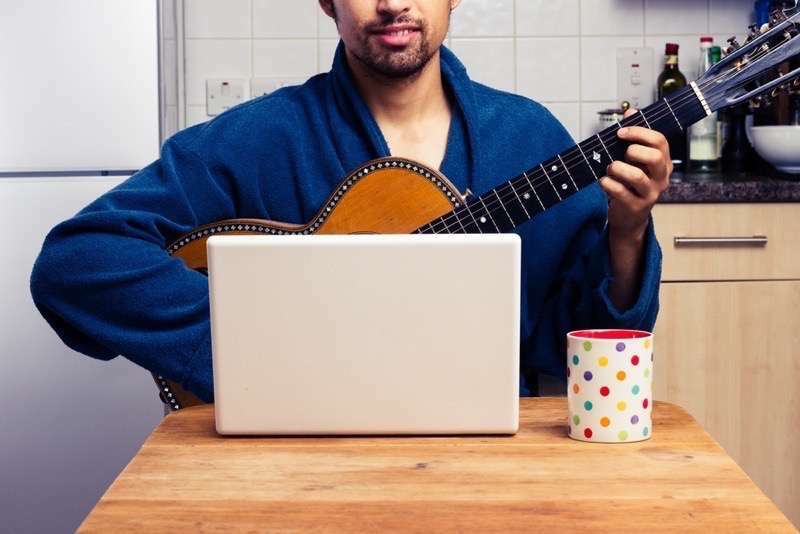 One important skill the guitar teacher learns is how to think on the go. Seeing dozens of students per week, one needs to quickly identify problems, and create solutions for them. Students may be surprised to know that many of the solutions suggested are brand-new, original exercises created for the purpose of helping a specific student with a specific problem. In fact, it may be best not to tell a student he will be the first to put this exercise to trial. But more often than not, it works. If the exercise is invented for fixing a specific problem, it tends to have the needed effect. Then there is already an answer ready for the next student with that problem. This is part of the art of guitar instruction. But in your practice, you have to take the role of your own teacher. Imagine that you want to improve your improvisation. Every day, you put on some jam tracks to play along with. You can play scale after scale, quite fast. You can play arpeggios and other licks that you’ve learned. But nothing you play interests you. Your dog leaves the room when you pick up the guitar. What’s wrong here? If it’s not your technique, what about your fretboard knowledge? If you know all of the scales, arpeggios and patterns, how can that be a problem? What about your ear training? Well, maybe we’re getting a little closer now because improving your ear might help. Singing some melodies from your head and pouring them out through the guitar might give you a shove forward. But most likely, this problem is in your heart, or in your vocabulary. You have technical ability, and you know what the notes are, but you’re not sure what to do with them. It’s like knowing every word in the dictionary but not knowing what to say when your parents say that you were left on their doorstep by Martians. Until you recognize the source of your inadequacy, and focus on building your weakness, you will never improve. And you’ll be a Martian. After several weeks of approaching the problem through different angles, a discovery is often made. The limitation of a guitar player is just an expression of the limitations in their knowledge, experience, and thoughts. You are the product of all of your inputs. If all you put into the machine is scale practice, then scales are the only thing that will come out. If you want to really grow as a musician, eventually you need to start playing music, and stop playing scales. And it doesn’t really matter if half of the things you try don’t work. As long as the other half do. You can, through practice, learn to identify your weaknesses and work on them systematically. You can become your own teacher by assigning yourself work that you believe is most likely to result in the biggest improvement. Take a moment to write down all of your strengths, weaknesses, and in-betweens (mediocrities) on the guitar. Write down all that you wish to be able to do. Now write down your most usual practice methods and musical experience. Do you see some link between the way you’ve chosen to spend your time and the outcome that resulted from it? This should come as no surprise. What can you do differently to achieve the result you hope for? This work may not be easy, and sometimes requires putting down the guitar and picking up a pen. But success requires the ability to plan, and stick to the plan in place—or revise it.